A prospective audit was undertaken of true day case laparoscopic cholecystectomies performed by a single surgeon in a DGH. The audit aims primarily to ascertain the outcome of the operation and patients’ satisfaction with the experience. Data was analysed to identify factors that led to overnight admissions. Data collected using audit proformas. Collected data included intra- and post-operative analgesics and antiemetics and a phone survey of patients on the day after the operation. We obtained postoperative complications and admissions data from patients’ records. 22 patients were admitted for day case laparoscopic cholecystectomy between June 07 and May 08. 17 (77%) were discharged on the same day. 5 patients (23%) were admitted, of these: 2 (40%) were discharged within 24h and 3 (60%) were discharged within 36h. 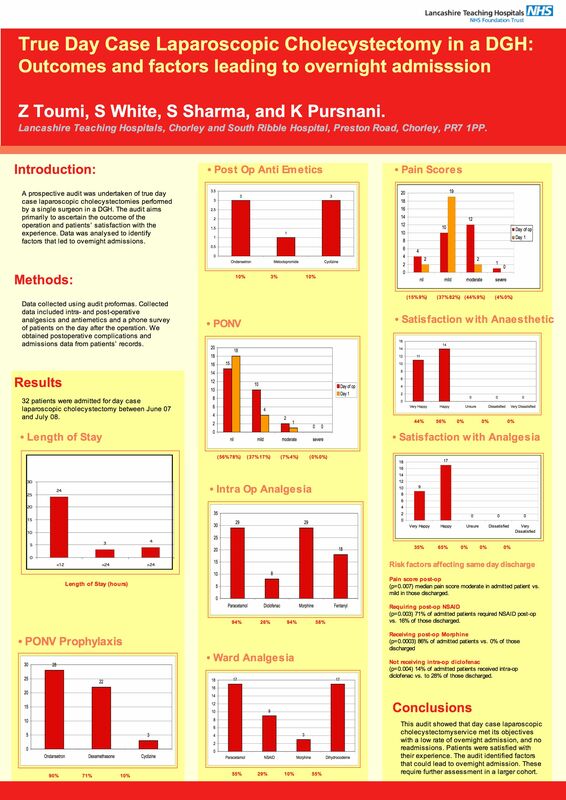 Indications for overnight admission were: optimisation of pain relief 4(80%) and pyrexia 1(20%). All patients were happy or very happy with their anaesthesia and analgesia. No patients required readmission after discharge. Statistically significant factors leading to admission are: length of operations (p=0.0007), not administering Diclofenac intraoperatively (p=0.003) and post-operatively (p=0.025), administering Cyclizine intraoperatively (p=0.002) and post operatively (p=0.001), adminstration of Morphine post-operatively (p=0.004) and not administering Ondansetron postoperatively (p=0.003). This audit showed that day case laparoscopic cholecystectomy service met its objectives with a low rate of overnight admission, and no readmissions. Patients were satisfied with their experience. The audit identified factors that could lead to overnight admission. These require further assessment in a larger cohort.